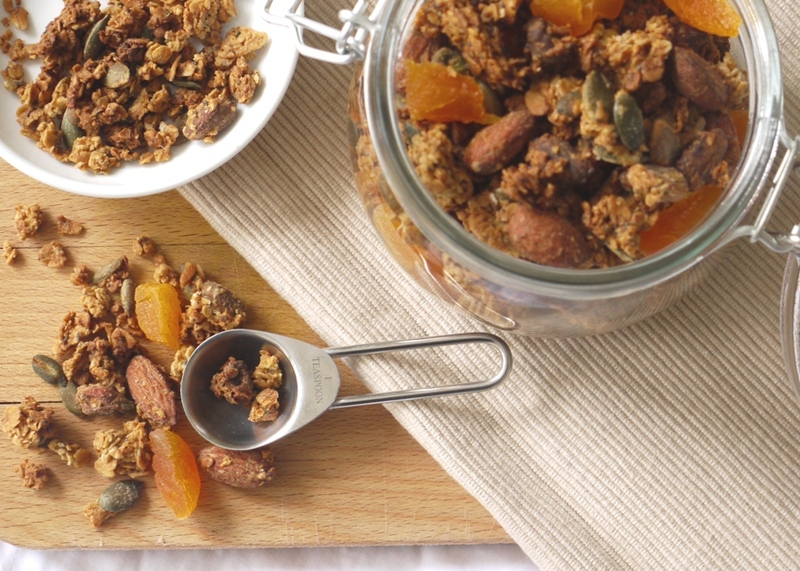 So today I’m bringing you breakfast in the form of my favourite chunky granola . . .
Valentine’s is one of those days I’ve always been slightly unsure about whether to celebrate. If you’re single it’s the ultimate salt in the wound, the kind of day that can end in crying under the covers, excessive watching of Bridget Jones on DVD and one too many glasses of Sauvignon Blanc. If you’re in a relationship, it’s the one day of the year when your love for each other feels strangely less unique, cooing couples, giant bouquets of flowers and grand gestures making appearances at every turn. That’s not to say I’m a complete scrooge about the day. Any excuse to tell my fiancé that I love him and – almost as importantly – any excuse to get stuck into some delicious food and indulgent desserts is absolutely fine by me. We won’t be eating out this evening (overpriced set menus and restaurants full of awkward first dates aren’t really my idea of a romantic evening) but there’s a sofa with our name on it and a tub of homemade milk chocolate cookie ice cream (this stuff is so good, I promise to post it soon) just waiting to be attacked shared with two spoons. In the morning, the Valentine’s merchandise cleared from the shops and all the fuss over for another year, we’ll wake up and eat breakfast together. Slow spoonfuls, sleepy smiles and a shared experience so much more important and – dare I say it – romantic than the forced celebrations of the night before. I’ve talked before about grand gestures versus the little things in life and I’m happy to reiterate my point today: you can eat as many incredible dinners out as you like with someone, but it’s only once you’ve enjoyed breakfast together that you’ll know they’re a real keeper. This granola recipe is the best I’ve come across so far. Sweet enough to feel like a treat but packed full of nutrients and slow-releasing energy in the form of nuts, seeds and oats, it’s the perfect indulgent start to the day. A mixture of maple syrup and honey means that no one flavour dominates but the two are interchangeable here, as are the oils. Granola is infinitely adaptable to personal taste so by all means swap in other nuts, seeds and fruit, add a little toasted coconut or even some cocoa nibs or chocolate chunks. I totally understand if you can’t quite cope with a Valentine’s Day recipe that doesn’t involve some sort of chocolate. Preheat the oven to 140 degrees C. Line two baking trays (or one large one) with baking parchment. Combine the oats, nuts and seeds in a medium bowl. Combine all the syrup ingredients in a small saucepan and warm gently over a low heat. Pour the syrup over your oat, nut and seed mixture and stir well to combine. Spread the granola over your two trays, forming a layer no thicker than 1cm. Bake for 40 minutes, stirring occasionally but being careful not to break up the clumps (unless you prefer a looser granola, in which case stir away). Once the granola has a dark, honey-like colour, remove from the oven. Don’t worry if it’s still a little soft: it will harden as it cools. 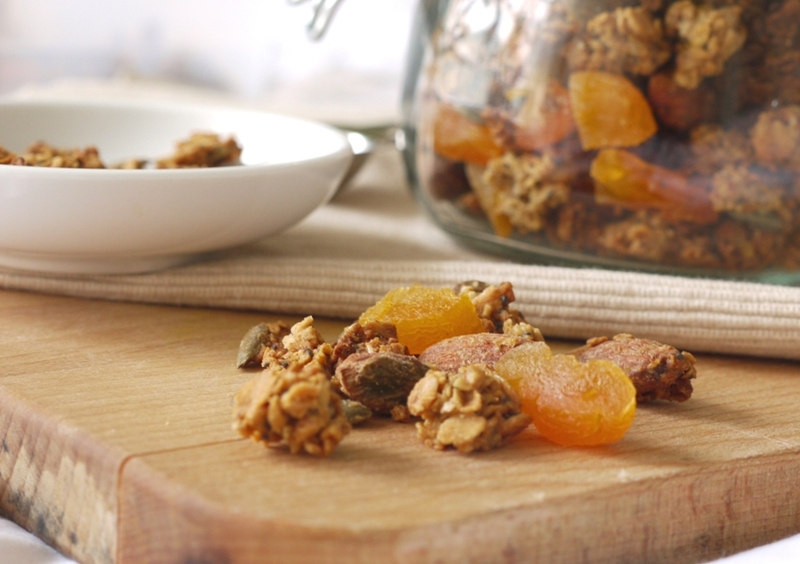 While the granola is still warm, but not hot, fold in the chopped apricots and break up any clusters that are too big. 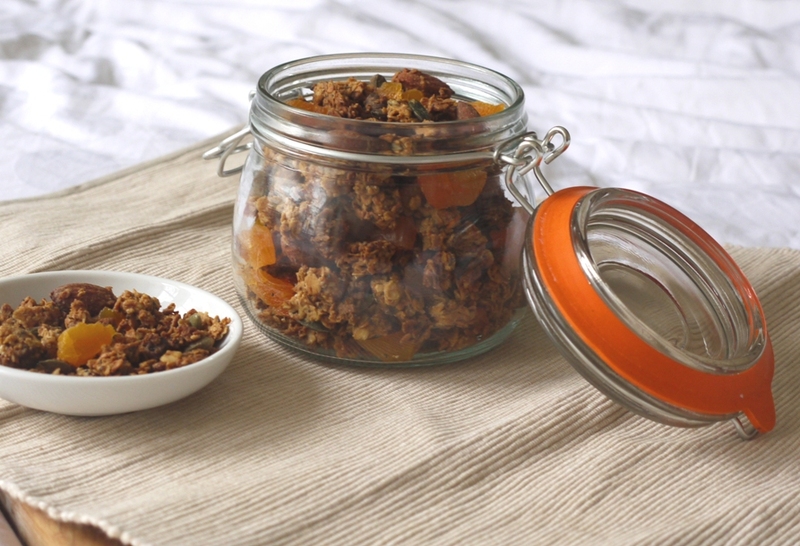 The granola will keep in an airtight container for up to four weeks. Being seriously moreish, I can’t imagine it would last that long in many households. Sleepy morning breakfasts together sitting happily and silently together is what real love is all about. Happy Valentine’s Day to you both. I always use the same granola recipe but am quite keen to branch out. This sounds lovely. I think there are few things nicer than breakfast together with your other half! So nice to find a granola recipe that doesn’t include raisins but still looks amazing! I love making homemade granola and have been making variations of the same recipe for years – but I might have to vary it a bit and try this one. The maple syrup is tempting me. Your thoughts on valentines day are very romantic, happy Valentines Day. Really should make my own granola – this sounds delicious especially with pistachios in, they’re a favourite of mine. Granola is very expensive at the store. Making your own is such a great way to eat well and save money. I make so much granola bars, cookies and granola that I buy 50lb bags from my natural foods distributer. As a professional chef havin an account at UNFI is great. I will try this recipe over the weekend. I totally agree that it’s the little things that are sometimes the most romantic. Happy Valentine’s Day to you and your fiance! Enjoy the ice cream tonight and the granola tomorrow! 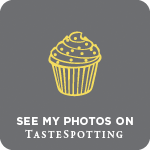 So glad to see a non chocolate post!! Happy Valentine’s to you and yours my lovely! 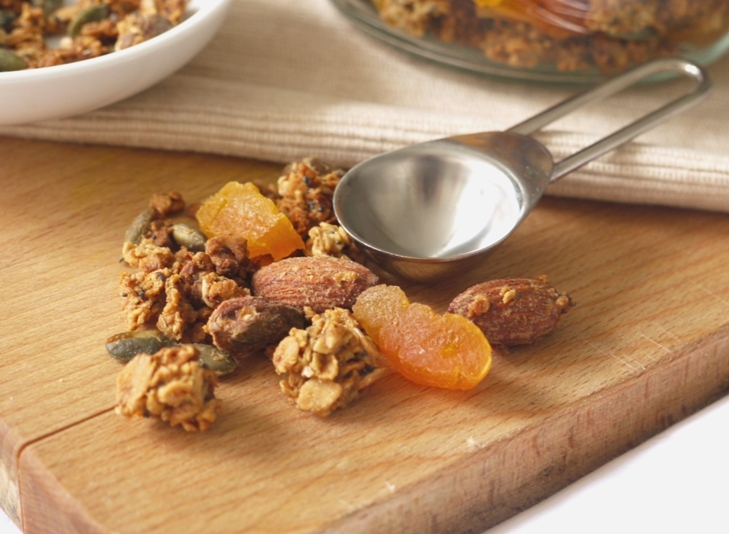 This looks like a great granola! Love the look of it. I have a question though– what is the difference between regular and jumbo rolled oats? I’ve never seen that distinction before. Maybe like in the US it is between the quick-cooking kind and the regular kind? A sofa and a bowl of ice cream sounds like the perfect way to spend Valentine’s Day. And then tomorrow morning you get to wake up to this delicious sounding granola. Perfect! 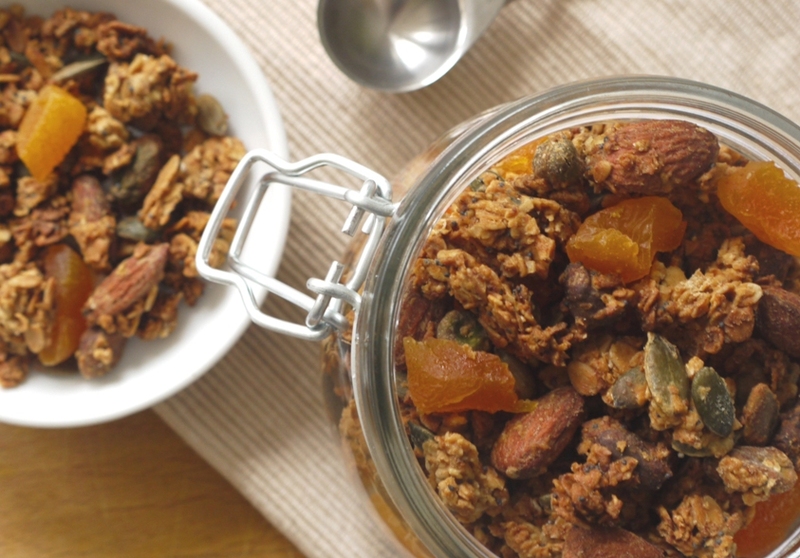 Granola needs to chunky–this looks delicious. I love the mix-ins. Valentine’s day is the worst day of the year to go out for a meal. I’m all for staying in and just enjoying the company. Oh I so want to make some of this! It looks really delicious – and makes a healthy snack! You’ve got us single girls all wrong, my V day was lovely! There’s a granola brand in wholefoods that I adore and occasionally treat myself to but the box lasts me 4 days max, and is so pricey. Let’s hope you can persuade more people to make their own. I like your big chunks, great for making your bowl last longer eh, I always find cereal disappears too quickly! Love your granola and those big chunks. I’m not usually much of a person for breakfast cereal, but I do love a good granola. Especially for snacking on. A picnic and chocolate cake sounds wonderful. Sadly it’s always a little frosty in the UK in Feb for a picnic (or an outdoor one at least)! I’m single and I had my best valentine’s day yet!! This looks very more ish and oh my goodness the ice cream sounds amazing! I keep meaning to try your tea and biscuit ice cream- you have the best recipes! Looking forward to a shared breakfast is probably the most romantic thing, you´re so right! And adding maple syrup to granola the perfect idea. Must make that adjustment to my go-to recipe. I love hwo big these chunks of granola are! it looks so tasty! This looks so lovely and tastes great too! I hope you don’t mind I have linked to this recipe on my blog but have changed a few of the ingredients. Thanks for posting it.